Today is my maternal Grandmother's birthday. I nearly forgot, but for an email reminder from Hotmail. Silly of me to be so wrapped up in Family History to be distracted from remembering a person I actually knew and loved. I've written about Grandmother over the years. She was a fairly unique character. I used to think she was the only Democrat in all of Oklahoma. Part of what I've loved about family history has been to learn more about the events that shaped the lives and the thinking of people in my family. Grandmother was born in 1898 and grew up fairly poor in Arkansas, one of a large family abandoned by her father. 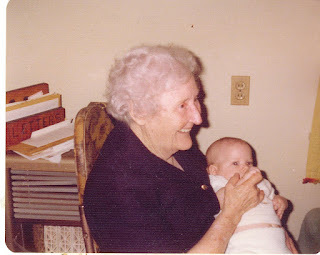 My other Grandma (who adopted my Dad) was born in 1890 and grew up one of many in a fairly middle class family in Minnesota. They couldn't be more different in their personalities. I have a cousin, John, in Buffalo New York who is a DNA wizard, being a retired professor of some closely related field if not that exact one. He slings around terms like iGP, autosome, mutations, crossover and I simply don't speak the language. But I've been learning a lot since getting my DNA test in May. And he's uncovering information faster than I can fill it in on my family tree! We still don't know who was the father of Grandmother's grandfather (don't even try to make sense of that). But the DNA findings in a large number of projects, including one about that specific surname, indicate that she was descended from a man John calls George the Surveyor. George is originally from Berkshire, England, and apparently was given large pieces of land for surveying the boundary line between Virginia and Maryland. And in some book it shows the lineage of George the Surveyor and how he is descended from Henry III (why they didn't take it all the way back to William the Conqueror, I don't know). I doubt Grandmother would give two hoots, but with my love of history I thought that was a marvelous discovery! And on another line, Grandmother is a direct descendent of Samuel Jordan, who can be found in Wikipedia, as well as many family history websites. I'm suddenly getting more interested in American history than I can ever remember being before. Now I just need more hours in the day! Happy Birthday, Grandmother - and thank you for your excellent family history! What a beautiful smile she has! And what a great lineage! I love getting lost in the family history/genealogy/ancestry etc. I'll need to look up Samuel Jordan now.